Canada Geese present a paradox. On the one hand, I would rather hunt ducks than geese any day. I guess I have spent enough days going to all the work of scouting and rigging for geese only to be thwarted by “flock intelligence” or just bad luck. 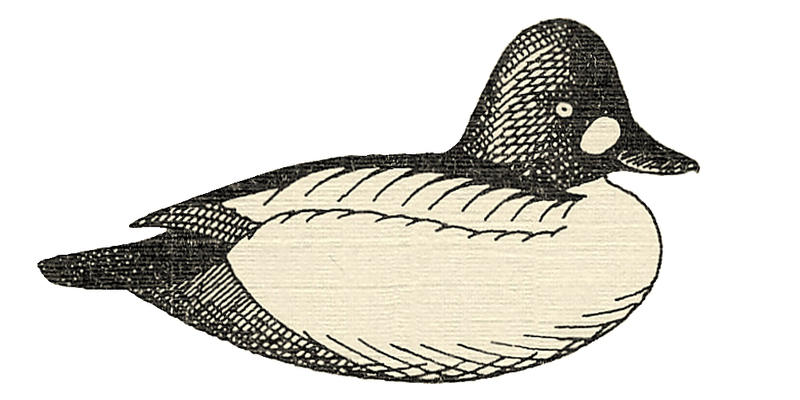 With ducks, singles and pairs are one’s bread-and-butter and so hope springs eternal throughout any duck hunt. With geese, though, it too often dawns on you that you have been outwitted once again. On the other hand, when geese do come, there are few things more exciting. Because they take so long to get there – and because they are usually hollering all the way – and because you can see every adjustment in their wings and body and feet as they commit, the excitement has plenty of time to build. 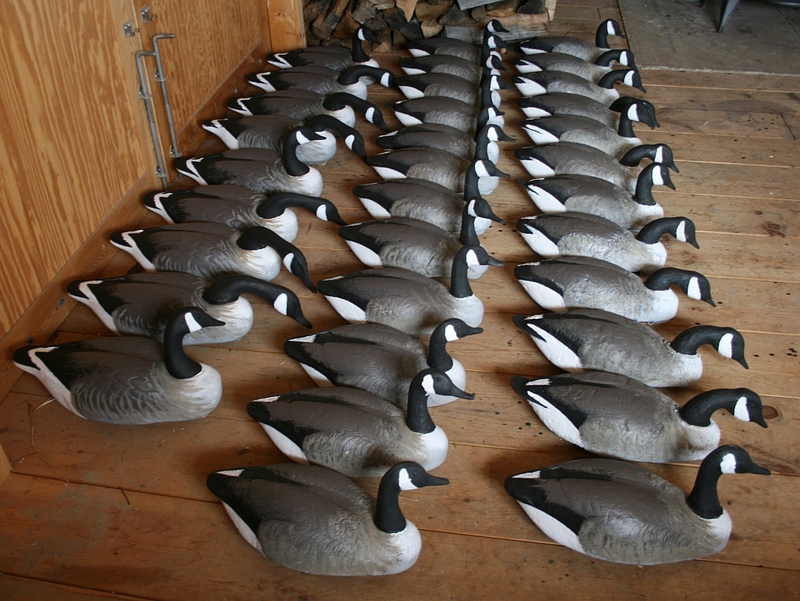 And, if there is but little wind, a flock of Canadas often enough serves up the opportunity for a triple – the pump-gunners ne plus ultra. Geese present another quandary, too. 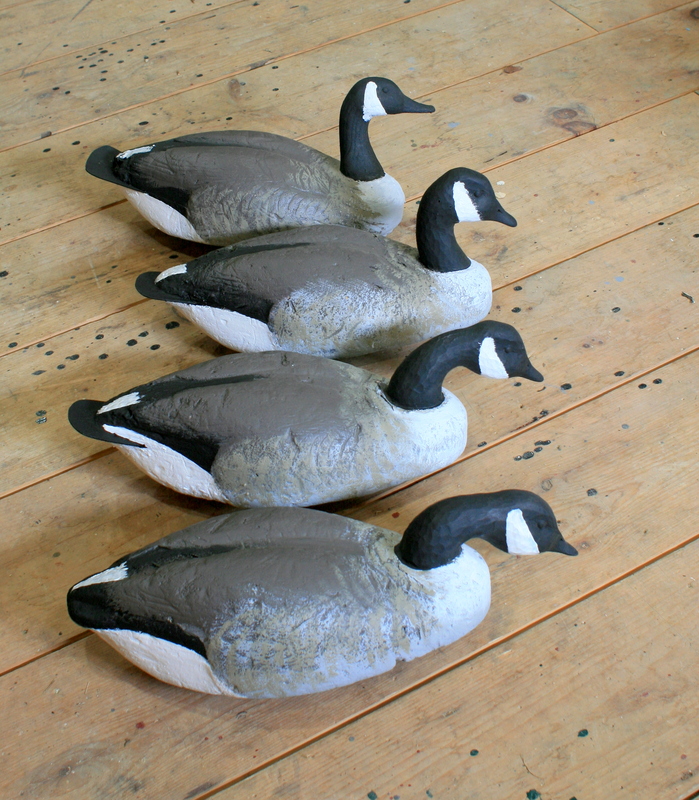 The decoys are so big – especially if you tend to like oversize stool – that fabricating a rig from cork or wood is simply too daunting for most of us. I have only carved a couple – both decoratives. The birds pictured above are Herters Model 81s. The top one is pretty much stock, with the original “tenite butyrite” plastic head so touted by George L. Herter himself. It has a new paint job because I re-painted all of my Herters Canadas as well as those of 2 partners after the season this past winter. Now they all match – important to the OCD that lurks, I think, in all carvers. The bottom 3 birds have wooden heads. I wanted to add some variety to my goose rig. I subscribe to the notion that different head postures give the illusion of movement to approaching birds. I note that I am in good company. Aldo Leopold, too – of Sand County Almanac fame – presented this same idea in an essay in Field & Stream in 1920. So, my dozen Canadas include a mix of High Heads, Swimmers and Feeders. 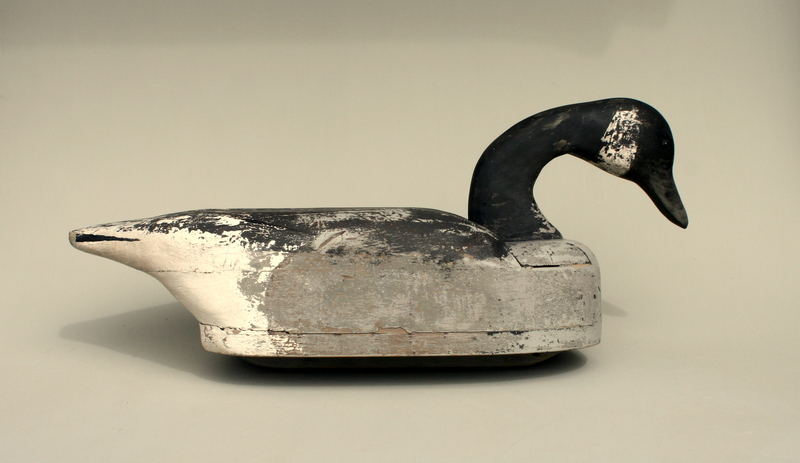 For many years, my Long Island rig consisted of a dozen Canadas and 10 cork Black Ducks. The Geese gave great visibility to the rig and – as long as they were not in the path of incoming Black Ducks – they helped me go home with 4 Brant and 1 Black – the respective daily limits for several years in the 80s and early 90s – many, many times. Here is the full rig ready for the 2013-14 season. All are Herters. Most of the 33 birds are Model 81s and some are the larger Model 92s. This decoy is one of my cherished possessions. It was built – probably in the late-1950s – by my Dad’s lifelong friend and gunning partner, Charles Zoubek, also of East Islip (Long Island, New York). He was known to my Dad and to us kids as “Zip”. He was evidently one of the slower players on the sandlot ball teams and I imagine it was hard not to pair Zip with Zoubek.